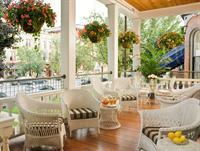 Saratoga Arms is a newly restored, historic hotel in Saratoga Springs, NY is located in the heart of downtown. Enjoy staying within easy walking distance of fantastic shopping, restaurants, museums, and colleges. Experience the grandeur of the Thoroughbred Races, only minutes from our front door. All of our beautiful rooms and suties offer private baths, individual climate control, cable TV, free Wi-Fi, complimentary Saratoga Water, plush robes, and a full breakfast.